As a young girl about four years of age. Ed and Eva Penrose and their daughter Dorothy. On a Primary hike, age 7. Dorothy is second from right. Dorothy Penrose and friends dancing. During the Depression years of the 1930s, Dorothy worked for a milliner making hats. Here she and friends are having a good time. This was taken in 1933. Dorothy is the tall one in the spotted dress. They appear to be dancing on a rooftop in Salt Lake City. A Woodland party: Perhaps an engagement party? Real estate photo of the home on 11th East that Dorothy and Phil bought in 1938. It would be their home for more than 60 years. Dorothy said that when they bought this home in suburban Salt Lake, the grass in the back yard was nearly waist high. Dorothy Woodland and brother Bud Penrose, Christmas mid-1950s. Note that Bud usually wore a bow tie. Left to Right: Reed Hyde and his grandmother, Dorothy Eva Penrose Woodland and her daughter, Reed's mother, Dianne Woodland Hyde, and Lucile Penrose Brown the sister of Dorothy's father. 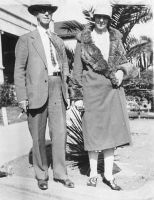 Second and third from left are Dorothy Penrose Woodland (Edwin C. Penrose) standing just in front of her husband, Phil Woodland. Counting from left to right, #8, tall man with dark hair is Dale Edwards Anderson, husband of Renee Edwards, who is standing to his right (with glasses.) Renee was a daughter of Gladys Lucile Jones Edwards. The children near them are most likely those of Renee and Dale. Food editor Bonnie Lake published Dorothy's recipe for cinnamon rolls. The editor at that time was actually Donna Lou Morgan. Dorothy Eva Penrose Woodland and Philip Adamson Woodland. Dorothy's memories of her family, her childhood in Salt Lake, life during the Flapper Era, the Depression, World War II and the Post-war years.